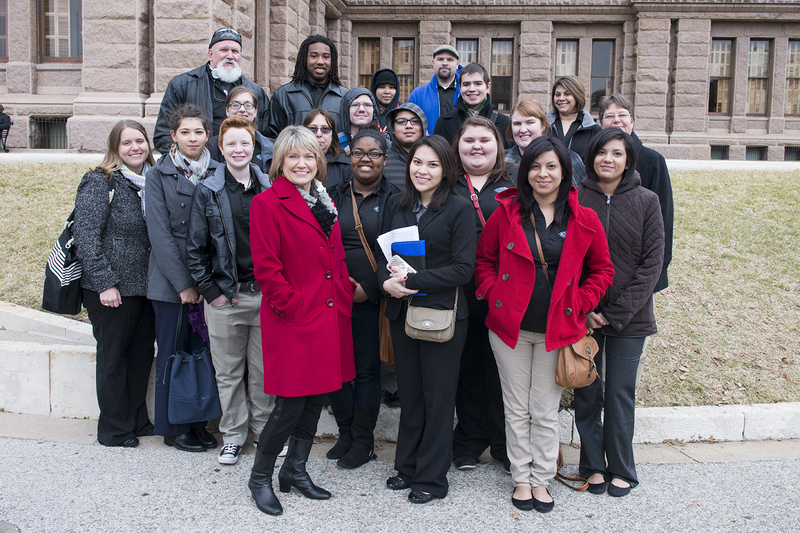 Brazosport College offers a broad range of courses to address diverse educational goals. Students planning to pursue a bachelor’s degree can enroll in introductory academic classes as well as courses in more than two dozen majors which transfer to other four-year schools. In 2005, Brazosport College began offering its own baccalaureate degree, the Bachelor of Applied Technology. For students seeking preparation in a technical workforce education field, Brazosport College offers courses leading to a certificate or Associate of Applied Science degree in 36 specialty areas. In addition, an ever-broadening continuing education program is designed to address the entire community’s needs. More than 150,000 students have attended Brazosport College since it opened 49 years ago. In 2013, Brazosport College awarded 701 degrees and certificates. 1948: Voters in the Brazosport Independent School District elect to create the Brazosport Junior College District. Summer 1967: Voters authorize a tax to support the maintenance of the college. The Board of Trustees of the Brazosport Independent School District divests itself of the college’s management, control, and operation. August 1967: The Board of Regents for the college district is installed. 1968: Dr. J. R. Jackson becomes the first president of Brazosport Junior College. Fall 1968: The first semester of classes begins with an enrollment of 879 students. 1970: Brazosport Junior College graduates 25 students. October 1970: The name of the school is changed to Brazosport College to reflect its broader purpose. March 1978: Dr. Jackson is named president emeritus. Dr. W. A. Bass, vice president of the college since its inception, becomes president. August 1988: Dr. Bass retires and is named president emeritus; Dr. John R. Grable becomes president after serving as vice president for eleven years. August 1996: Dr. Millicent Valek becomes president. Dr. Grable is named special assistant to the Board. 1998 - 1999: Brazosport College celebrates 30th Anniversary. December 2004: The Commission on Colleges of the Southern Association of Colleges and Schools grants Brazosport College accreditation as a baccalaureate level institution. May 2007: Brazosport College awards the Bachelor of Applied Technology degree to its first class of industrial management graduates. 2008 - 2009: Brazosport College celebrates 40th Anniversary. 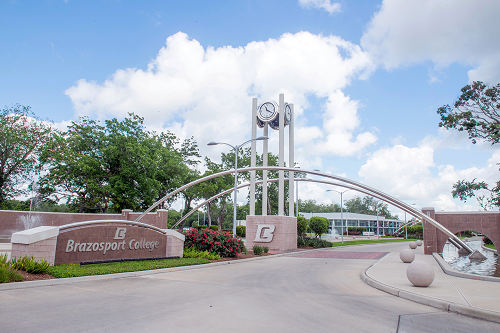 Brazosport College celebrates 45th Anniversary and is selected a Top 10 College in the nation by the Aspen Institute. Brazosport College adds a new baccalaureate degree program in Healthcare Management and is selected as a Top 10 College in the nation by the Aspen Institute. Brazosport College exists to improve quality of life by providing certificate, associate and baccalaureate degree programs, academic transfer programs, workforce development, and cultural enrichment in an efficient and cost effective manner. The board, faculty and staff are committed to student success and lifelong learning by responding to student needs, creating a dynamic learning environment, and enriching our communities. As the College of Choice, the Brazosport College board, faculty, and staff will be broadly engaged in supporting all students intellectually, socially, and culturally, preparing them to thrive within the global community. As a national leader of student success initiatives, the College will develop lifelong learners and prepare competitive graduates for tomorrow’s workforce. Student Success: Creating a learner-centered institution focused on academic excellence, we engage all students through multiple strategies to attain educational and personal goals. Partnerships: Fostering innovative partnerships, we contribute to the educational, economic, and cultural advancement of our local and global communities. Integrity: Adhering to the highest ethical standards while promoting personal and social responsibility, we are accountable for the use of college and community resources. People: Recognizing that education is a human endeavor, we create a welcoming, safe, and inclusive environment in which all people are encouraged to pursue excellence. Continuous Improvement: Establishing evidence-based processes to set student success goals, the College evaluates its programs and services to drive measurable continuous improvement. 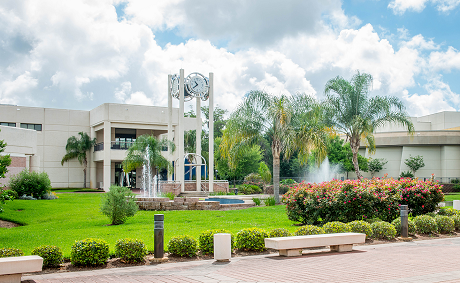 The Brazosport College campus occupies 156 acres of beautiful, naturally landscaped land bounded on two sides by the winding Oyster Creek. It is convenient to all the towns and cities in Southern Brazoria County: 22 miles from Sweeny, 19 miles from West Columbia, eleven miles from Brazoria, eight miles from Freeport and Angleton, and contiguous with Lake Jackson, Clute, and Richwood. In addition, it is easily reached from Highways 288, 332, and 288B. The Clarion is the home of Brazosport College’s music program. It also serves as a venue for various performing groups and community ensembles. It includes a 600-seat performance hall acoustically designed to meet the highest standards for live music performance. The Clarion’s classroom and rehearsal hall space houses an exceptional music program. Chemical technology programs benefit from the availability of a process trainer on campus that allows students in process technology, instrumentation, and laboratory technology to develop their knowledge using true to scale control instrumentation. The trainer and several smaller plants have been developed in cooperation with partnering local industries. The Bill and Julia May Children’s Center at Brazosport College provides top quality, affordable child care services at a reasonable cost that is competitive within the community. 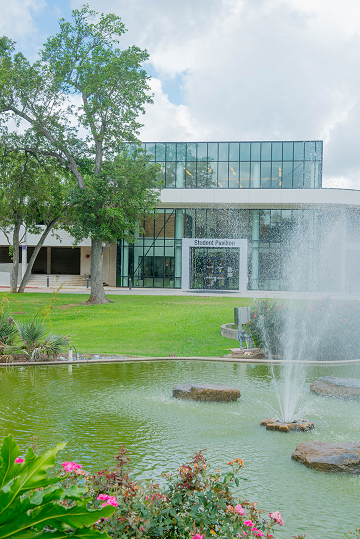 Brazosport College’s Corporate Learning Center is the home of the Center for Business & Industry Training, a provider of a large range of consulting and educational services to area businesses. The Small Business Development Center also operates from the Corporate Learning Center. Recently completed projects include the Byron and Sandra Sadler Health Professions and Science Complex, the Dow Academic Center, the BASF Center for Process Technology, the Library, the Student Pavilion. The Freeport LNG Crafts Academy is now home to the construction and mechanical technologies. Finally, the BCPC Welding Technologies Laboratory was opened in the spring of 2016. The Dow Academic Center (DAC) is a community resource that complements other meeting and event space at Brazosport College. It is available for rental for private parties, trade shows, corporate events and charity benefits. Brazosport College offers community education services on the main campus, as well as, through a Community Education Center in Freeport. Brazosport College is an institution for commuting students and does not operate dormitories or a housing office. Students and their families are responsible for locating housing and making housing arrangements. Brazosport College is accredited by the Southern Association of Colleges and Schools Commission on Colleges to award associate degrees and baccalaureate degrees. Contact the Commission on Colleges at 1866 Southern Lane, Decatur, Georgia 30033-4097 or call 404-679-4500 or go to http://www.sacscoc.org for questions about the accreditation of Brazosport College. The Texas Common Course Numbering System (TCCNS) is a voluntary, co-operative effort among Texas community colleges and universities to facilitate transfer of freshman and sophomore level general academic coursework (click Transfer of Credit for more information). Brazosport College guarantees to its graduates with degrees of Associate of Arts, Associate of Arts in Teaching, and Associate of Science and other students who successfully complete college transfer courses with grades of “C” or better, the transferability of course credits to those colleges and universities which cooperate with Brazosport College in the development of course equivalency guides and/or articulation agreements. If these transfer courses are rejected by the college or university, Brazosport College will waive tuition costs for appropriate courses which are acceptable to the receiving institution, provided all of the conditions are met. Brazosport College guarantees that students who satisfactorily complete an occupational-technical degree or an advanced certificate of at least 25 or more semester credit hours will have the job skills for entry-level employment in the occupational field in which they received the degree or advanced certificate. Brazosport College offers a wide variety of educational opportunities through the Department of Community Education. These non-credit programs offer occupational and career training, job readiness skills, professional education, senior adult courses and activities, youth programs, certification programs, as well as basic skills, language improvement classes, courses for pleasure and recreation, and arts and crafts. Classes are open to any adult, age 17 or older (except the youth programs), or students eligible for concurrent/dual enrollment, regardless of educational background. Teen program classes provide opportunities to learn everyday skills like cooking, as well as fun dance classes. Teens can also learn to decorate on a budget or they can take introductory courses in the technical skills field to sample career choices they may not have considered. Community Education provides opportunities in a variety of areas, including hobbies, personal health, physical fitness, and even to learn a new language. Courses are tailored to meet community needs and interests. Please call 979-230-3600 for additional information. Non-credit courses in the following areas are scheduled at various times during the academic year. Interested persons should check the Community Education schedule available from the Community Education Centers or online at http://www.brazosport.edu/ce to determine the particular courses offered each term. Courses may also be organized to provide customized training for industry or groups. For more information, call 979-230-3600. Registration for Community Education courses is continuous throughout the year. Course schedules are distributed by mail and available online for the fall, spring, and summer terms. Schedules and online registration are also available on the Brazosport College website or through the Community Education Centers. Adult Education courses are offered to assist adults in acquiring needed basic skills. The areas for students include English as a Second Language, Adult Education and Literacy, and High School Equivalency (HSE) and workforce training. Adult Education and Literacy (AEL) is the fundamental instruction and study of materials and subject matter equivalent to grades 1 through 8. This course is for the adult in need of skills in reading, writing, and arithmetic up to the eighth grade level. Upon successful completion of this program, students will be able to read newspapers and popular magazines, handle finances (checkbook), and improve job skills. For more information, call 979-230-3597. High School Equivalency (HSE) is preparation for the High School Equivalency Diploma, which may be acquired by passing the HSE exam (formerly the GED Exam). A pre-test is required to determine if a student is eligible to take the official test or if the student needs additional preparation. This course is for the adult whose high school education was interrupted. These classes allow students to progress from the 9th to 12th grade at their own pace in five areas: writing, social studies, science, reading, and math. Students must be at least 18 years old. Those who are 17 can enroll with parental consent and formal withdrawal papers from the last high school attended. English as a Second Language (ESL) offers non-English speaking adults an opportunity to develop an understanding of the spoken language or to improve existing language skills. This course is for adults who want to speak and write practical, everyday English. The Center for Business & Industry Training (CBIT) offers customized training and consulting to businesses and industries, freeing organizations to focus on core business functions. The CBIT delivers training expertise utilizing professionals with proven industry experience. Training may be done on company sites or at Brazosport College’s Corporate Learning Center in state-of-the-art training rooms. Facilities: CBIT is housed in a 45,000 square foot facility that includes multi-use classrooms, breakout rooms, computer labs, on-site catering, convenient parking, and a communication suite for client use. Through its event planning services, CBIT may host business meetings or special events. CBIT employees are available to meet all your facility needs in scheduling, implementing, and evaluating events. CBIT’s combination of detail-oriented planning employees and availability of on-site services ensures your event will run smoothly and hassle-free. Computing/Internet Solutions: Flexible computer training formats include fast track classes for the busy professional or in-depth sessions for individuals desiring more hands-on experience in popular software courses. CBIT staff offers custom design and creation of: databases, internet web sites, and file conversions of spreadsheets and databases. Professional Development: A variety of soft-skill courses are available ranging from communication skills to team development. Training, built on workforce competencies, is designed to enhance today’s fast-paced organizations. Consulting and coaching are tailored to assist teams with real life work issues where they apply tools and techniques learned in training. Technical/Safety: CBIT offerings include a series of technical learning opportunities including new hire and incumbent training for process operators and instrument/electrical technicians. Custom solutions can also be created to meet specific industry or company needs. General safety training and regulatory training to meet industry specific requirements are offered. Workforce Development: Assessing workplace skills and providing training to close gaps for the incumbent workforce is provided by CBIT. Through foundational and technical skills training and testing, workers are equipped with the skills needed to succeed in today’s workforce. For more information on these programs or other business/industry training needs, call 979-230-3050 to arrange a free consultation. 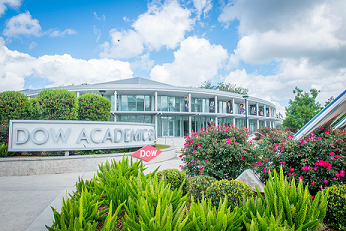 The Dow Academic Center (DAC) is a community resource that complements other meeting and event space at Brazosport College. Opened in 2011, the large event space provides for community and business events including banquets, receptions, and trade shows. In addition to the Commencement Hall that accommodates 2,000 guests, the Center also has a Regency Suite with private dining room, Green Room, ticket office, office space and preparation kitchen for approved caterers. America’s Small Business Development Center (SBDC) Network is the most comprehensive small business assistance network in the United States. The mission of this network is to help existing businesses become more competitive in the complex marketplace of our local and global economies and to help new entrepreneurs realize their dream of business ownership. The Brazosport College SBDC was founded as a joint venture with Brazosport College in 1988 and is part of the Texas Gulf Coast SBDC Regional Network, which serves 32 counties in Southeast Texas through 15 centers. All of our services are provided at minimal or no cost because of the financial support from our funding partners. For more information visit our website at http://www.brazosport.edu/sbdc or call 979-230-3380.